Hello from Desolation Sound! Today we had an easy cruise from Pender Harbour up to Squirrel Cove. Overcast skies, a bit of chop leaving Pender Harbour, but overall a very easy day. 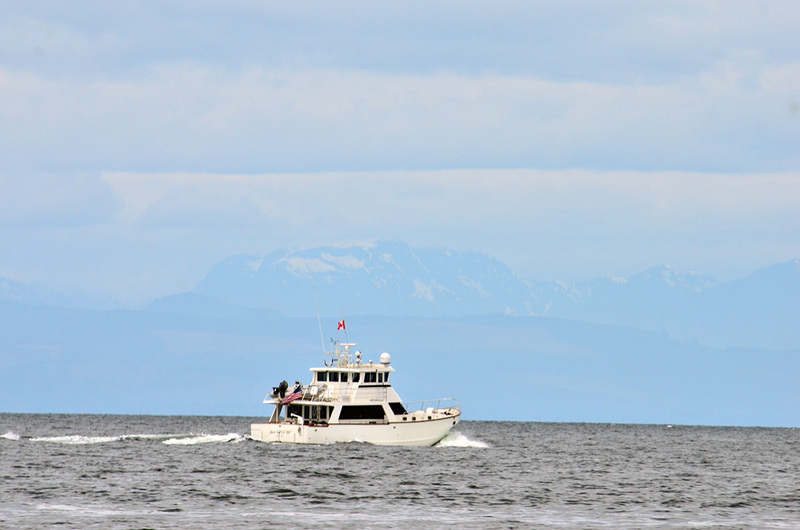 Barely Get'n By, the biggest boat in the fleet, heading for Desolation Sound. Mountains on Vancouver Island in the background. In years past, we've stopped in Prideaux Haven on the flotilla. 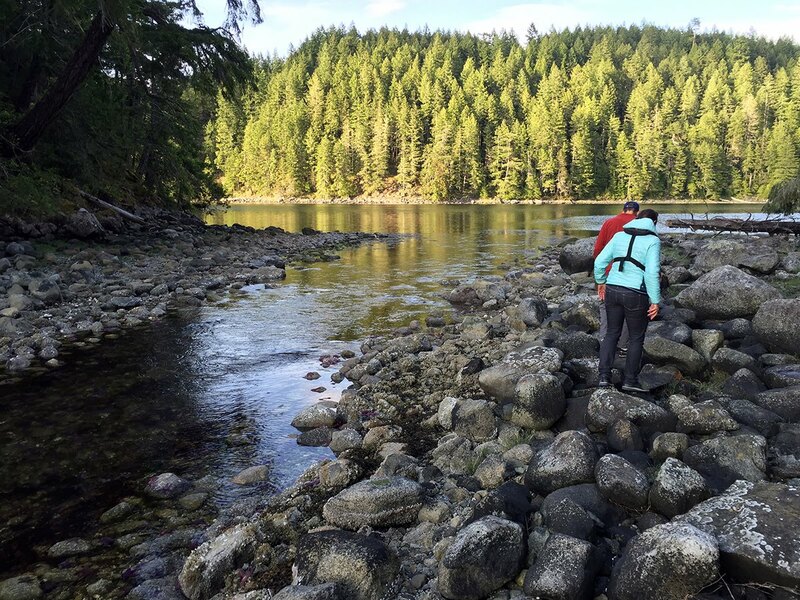 Prideaux Haven is beautiful—the quintessential Desolation Sound anchorage, really, but it's a little off our route. Because of the time of slack at the rapids tomorrow (we're heading through Yuculta Rapids, Gillard Pass, and Dent Rapids), I chose Squirrel Cove this time. If we'd been at Prideaux Haven we'd need to leave by 5:30 a.m. Leaving from Squirrel Cove, we can "sleep in" and depart at 6:45 a.m. 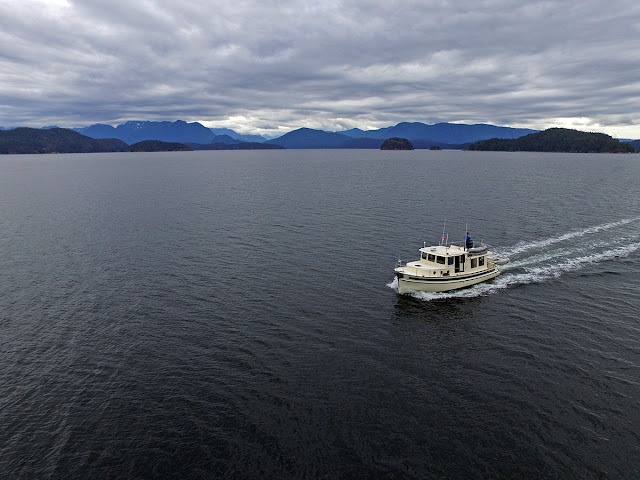 Even in overcast conditions, arriving in Desolation Sound is dramatic. I had to fly the drone. Tonight is our first night at anchor. For a few of the people on this trip, this is their first time ever anchoring. Everyone's doing a good job so far, and Squirrel Cove has lots of room to practice anchoring. A few people have experience boating elsewhere, and I've had to convince them that in the PNW, we don't anchor on 7:1 scope. After seeing that 3:1 really does work, they're starting to come around. Once we anchored, Kevin and I visited each boat and laid out the plan for tomorrow. Transiting the rapids between Desolation Sound and the Broughtons requires care and planning. Our goal is to time it so perfectly that participants ask, "what rapids?" We also try to teach people how to calculate the timing for their trip south and future trips north. Instead, we beached the dinghy and walked around. 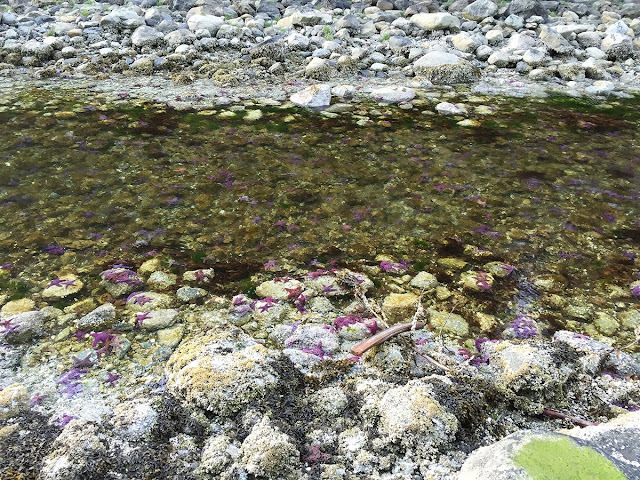 There were a TON of starfish and sea cucumbers. The water in the lagoon was surprisingly warm...comfortable swimming temp, but I was conveniently wearing jeans. Tomorrow we're off to the rapids, then Blind Channel Resort for the night. Glad to read all is well & like the updates. Sounds like lots of fun. Good luck with the rapids today.